How do I allow a submitter to edit a submission? Open a submission for editing when you receive a submitter's edit request. Organizations (Level 5 team members) can select submissions from their Submissions List and open them up for editing by the submitter. This feature benefits both the organization and the submitter. 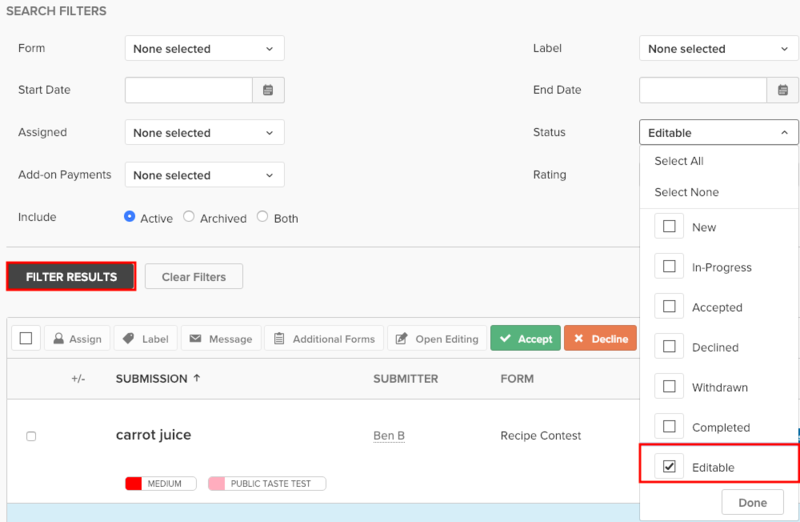 It lessens team member workload by allowing submitters to add, replace, or delete files attached to a submission and to edit their submission form field entries. For example, an organization can ask a submitter to make specific edits to a manuscript. A submitter can add a new manuscript version to an existing submission. Or, if a submitter makes a mistake in a submission, he or she can request that the organization open the submission for editing. 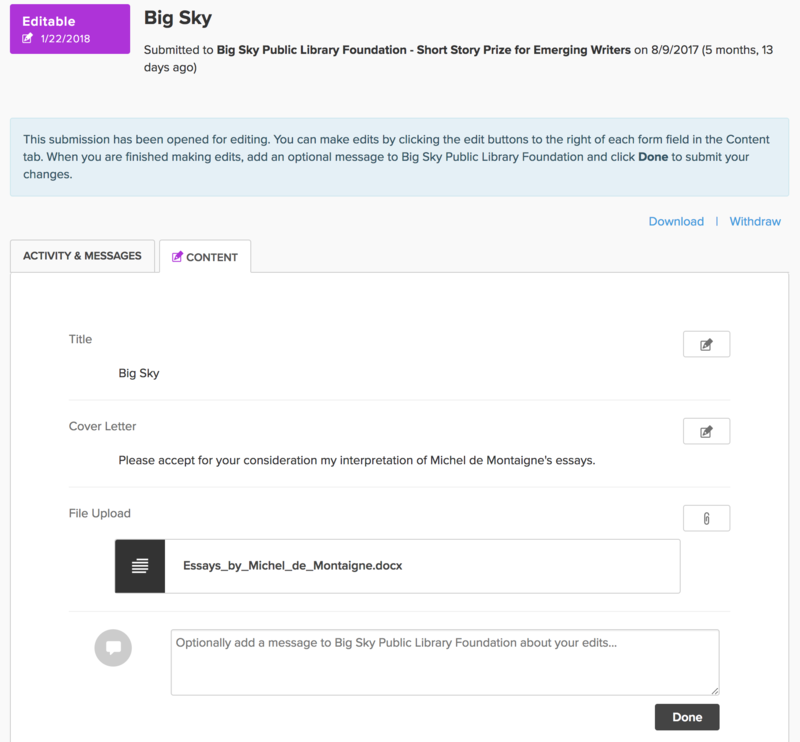 Have you received an email request from a submitter asking for the ability to edit their submission? If you have turned on the ability to receive edit requests from submitters and have received an email request from a submitter, the notification email will include a link you can click to take you directly to the Submission's Details page. If you have not received an email request from the submitter but still want to open it for editing, simply find the submission in your Submissions tab and click on its name to go to its Submission Details page. To open the submission for editing, click the status dropdown menu at the top of the Submission Details page. Select Open Editing. 2. A dialog box will open. Select a Response Template to send to the submitter, type a message, or leave the email message blank. 3. Choose the From email address. 4. Click the MARK AS EDITABLE and Send Response(s) button. 5. The submitter will receive a notification email and be directed to their submission's Details page, where they can edit the submission. An Edit Button (pencil icon) for each form field will be on the right-hand side of the field. When the submitter is finished making edits, he or she will add an optional message to your organization and click the Done button to submit the edits. 6. Your organization will receive an email notification stating that the submission was closed for editing by the submitter. The submission will no longer be highlighted in blue in the Submissions List, and the submission status will change from Editable back to In-Progress. In your Submissions tab, select one or more submissions by clicking the check box(es) on the left-hand side of the screen. Click the Open for Editing button (shown below) at the top of the submissions list. 3. A dialog box will open. Select a Response Template or type a message. 5. Click the MARK AS EDITABLE and Send Response(s) button. The editable submission row will be highlighted in blue and the submission status will be changed to Editable. To locate submissions in your Submissions tab that are currently open for editing, open the Search Filters panel by clicking the Show Search Filters button at the top of the submissions list. Select Editable from the Status dropdown list and click the black Filter Results button. To close a submission for editing before the submitter closes it to editing, open the submission from the Submissions tab to view the submission's Details page. Click the status dropdown menu at the top of the screen and select Close Editing. 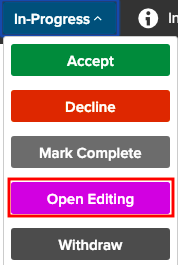 Choosing any other option (Accept, Decline, Mark Completed, Withdraw) will also close the submission to editing. 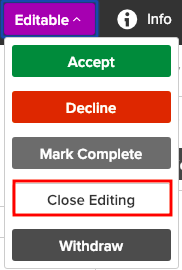 To close multiple submissions to editing, go to your Submissions page and select the checkboxes next to the submissions you would like to close. At the top of the Submissions list, click More > Close for Editing. Choosing any other submission status will also close the submission to editing.